So, you want to spray paint stencils! Great idea. It's fun and the results can be very rewarding. So, let's get started. Spray paints leave a clean, smooth finish that is free of paint brush lines and the splotches that sponges might create. But, as easy as it is to spray paint from a can, it’s not so easy to get good results. So, there are a number of tricks you need to know about. 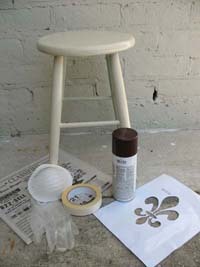 On this page we'll be using spray paint stencils to paint a fluer de lis on a stool. So, if what you are searching for is more like Graffiti Art Stencils, don't worry we have that too. Just click over to check out a couple of videos and some free printable stencils that may be more of what you have in mind as spray paint stencils. The challenge with spray paint stencils is getting crisp edges and clean lines. Most commonly the end result is a fuzzy image. That's just the nature of spray paint. If your project is going to be OK with fuzzy edges then you’re in business. In fact, if that's what you are trying to achieve, then you should know, the further you hold a stencil from the surface the fuzzier it gets. However, if you still want to spray paint stencils and need crisp edges then read on for all the tricks you'll need to know. To get clean lines, you need to make sure that the stencil is as close to the surface as possible. If any part of the stencil is lifted it can allow paint to spray under (which is called “overspray”). One way to make sure that your stencil is in good contact with the surface is for the stencil to have an adhesive backing. There are a couple of ways to do that. You can copy your stencil onto a piece of full page label paper and cut it out. Or you can coat the back of the stencil with spray adhesive or a glue stick. I need to tell you that if you use a sticky back stencil you may have a problem with the background paint or finish being lifted off with the stencil when you are finished painting. Make sure to read all instructions on any products you use and test before doing your project. If you've decided to use spray glue, place your stencil face down on a piece of newspaper and spray the back side that will be placed on your surface. I know this sounds silly because of course you are going to spray the back side, right? But how many times are we doing something with our minds somewhere else and before we know it… Well, anyway, I just wanted to remind you. Also, make sure to spray with newspaper underneath. Spray glue is like spray paint – it goes everywhere! Let’s say you want to work with a glue stick. It’s best to tap the glue around the islands and bridges. If you drag the glue stick you will likely get globs of glue around the edges of the islands. In order to get crisp edges on your painting the island have to be clear of glue. By the way, this web site has plenty of cool stencils for your spray paint stencils project. Here are some of the things that you’ll need. Of course, you’ll need paint. I’m not going to recommend any brands because what works for me may not be what works for you. All I can say is to experiment with different ones until you find a brand you can stick with. Some of the qualities you want to look for in a spray paint is truthfulness of color and a consistency that is not too thin. It just needs to spray on a nice color. Experiment with a few until you find the one you like. You also want to find a brand that can offer some reliability of the nozzle. There is nothing worse than having a nozzle that clogs and sputters out large blobs of paint. I have found that just because a paint is more expensive does not necessarily mean it is the better choice. A can of discount brand paint may not go as far as a more expensive brand. So, you need to buy more of the discount brand paint. However, you may still come out ahead in the long run. You be the judge. Also, I have had some paints create a crackling effect when sprayed. The best way to keep this from happening is to apply a thin layer of spray paint and let it dry thoroughly before another coat. It’s better to apply many thin coats of paint than to try and finish it quickly with one or two thick globs of paint. Spraying a thick coat of paint can cause a number of problems besides cracking paint (like running, pooling, dripping…). And you’ll need stencils – hence the spray paint stencils part! The variety of stencils available to you is mind numbing. So, it’s next to impossible for me to recommend any one kind of stencil because I don’t know anything about your project. My best advice is to experiment and test different stencils and materials. Are you working with a thin or thick stencil? When using a stencil made of thick materials (like plastic) you need to spray at a perfect 90 degree angle especially around the edges. If you spray from a side angle, the edge closest to the sprayer will be fuzzy because the spray of paint is blocked by the thickness of the stencil. On the other hand, a thick stencil which is durable and heavy will cover your surface better and prevent overspray. A stencil made from a thin material (like paper) doesn’t have an edge thick enough to block the paint as it is sprayed. So the edges should be crisp even if you are not holding the can at an exact 90 degree angle from the surface. However, a thin material (like paper) might be flimsy allowing paint to get under the edges if it curls or gets blown by the spray. If you are using paper, you may want to consider an adhesive backing option as described above to keep this from happening. Again, if you need help creating a stencil, refer to the How To Make A Stencil. Then come back to Spray Paint Stencils! You'll need an object to paint. It can be anything you want – a t-shirt, furniture, floor, rug, cardboard…whatever! 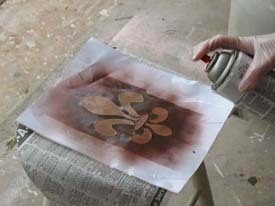 Just make sure that the surface to be stenciled is prepared properly. If it has a previous layer of paint, make sure it is dry. Paints do not stick well to semi-gloss or gloss paints. So, if you are painting the entire surface of the item before you stencil, use a flat paint. If it has already been painted, you may need to sand it down to rough the finish. If you are stenciling art on a t-shirt or other fabrics, make sure they are washed so that any surface treatment which may discourage paint from sticking has been removed. Scroll down for more about fabric stenciling. I do not advocate illegal graffiti so if you plan to use spray paint stencils on a train or a building, make sure you own it! I am going to recommend safety gear like a face mask or respirator, eye protection and rubber gloves. You need to be aware that spray paint is very toxic and you don’t want to breathe it in especially over long periods of time. If you are spray painting inside, get a good respirator. Remember it’s always good to be safe than sorry! You'll also want to have some old newspaper to cover the areas around the stencil from overspray. Spray paint has a way of going everywhere. It gets carried in the wind and lands on any exposed surface. So it’s important to cover anything you don’t want to have a painted haze. Get some masking tape to secure the stencil and any newspaper that you use. Find a good place to apply the spray paint. Hopefully you have a room with good ventilation. However, you don’t want to be in an area where there is a breeze and dust is blowing around. First, you want to secure your stencil to the object to be painted and cover all exposed areas outside of the stencil with newspaper. If you don’t use an adhesive on the back of the stencil as described above, then tape down all the edges so that your stencil will not move during the entire process of painting. 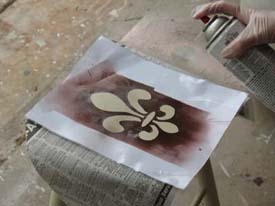 For the fleur de lis stencil, I tapped a glue stick on the back side of the stencil over the thin bridges and around the edges of the fleur de lis. This made the stencil adhere better to the surface and helped in preventing overspray. When the stencil is in place on your surface to be painted, run a finger firmly around all of the edges. When spraying paint, hold the can 8 to 10 inches from the stencil. Use a gentle waving motion, spraying paint in horizontal lines from side to side. Release the nozzle at the end of each row and move down far enough so that when you start to paint your next line in the other direction, you are starting a new line and not repainting over the last line. You are looking for a slow and gradual build up of color with even coverage. Allow the paint to dry thoroughly after each thin layer. Be careful not to let the paint build up too fast because it will run, drip, create ripples like in a pool or start a crackle effect as it dries. Remember, it's going to take several layers of paint with a time period for thorough drying in between. No rushing! Don’t try to paint the outline of the stencil. Just stick to the back and forth motion described above. Forget that you are working with a spray paint stencil and just sweep across the entire surface as though you are painting the whole area. Again, this is going to help you build up a gradual and even layer of color. Make sure to hold the can upright at all times and spray toward your surface at a 90-degree angle. Holding the can upright keeps the flow of paint consistent. Let the paint dry thoroughly before lifting the stencil. Removing a wet stencil can cause smudging. Try to pull the stencil straight up or hold down at one end and roll it up carefully from the other end. The idea is to avoid dragging the stencil over a wet surface. And Voila! It's finished. How was that for the first spray paint stencil project? Display your artwork proudly! 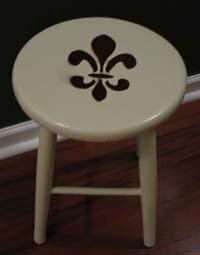 Here is the finished Fleur de lis stool (just like pictured above). It was a simple project, but I think it will at least show you the steps needed to spray paint stencils on your own. Ready for another spray paint stencils project? 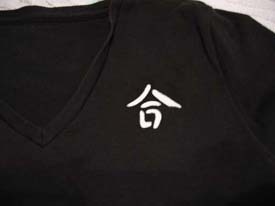 This one involves painting a Chinese Harmony Symbol Craft Pattern onto a Black T-Shirt (just click on the image or the blue text). Below is a small sample of the design books that we offer. 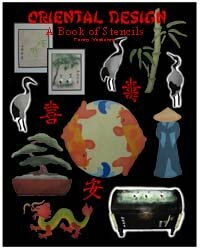 These books include the designs used as examples for these spray paint stencils projects. Each book will come to you as a downloadable pdf file in your e-mail. Just check your e-mail after purchase for the link to connect to your file and print or save. It's that easy! Click on the Book Cover Photo for more Project Ideas! 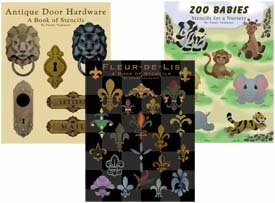 If you’d rather get your Stencil Pattern Books in Print (like these or the ones pictured above), then visit our Printer’s Book Shop for a large variety of stencil collections. 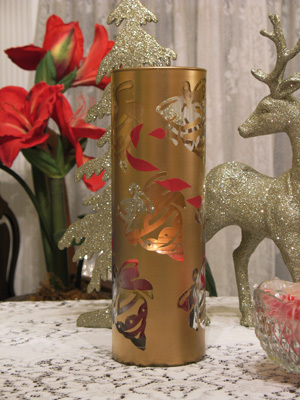 You’ll find all of the stencil designs used as samples throughout this site. 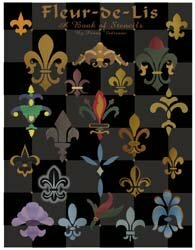 The Fleur de lis stencil, the Chinese Harmony Symbol stencil and all of the examples used on this web site are courtesy of Designs From Penny. And that’s about it for Spray Paint Stencils! Thanks for visiting and I hope you found what you were looking for on this page. Happy Stenciling! Oh yeah! Just in case you need to know where to go for supplies specifically for spray paint stencils, here are a few of our affiliates with a few words about what they have to offer you. MisterArt.com is a great place for all of your arts and crafts needs plus they have a section dedicated to stenciling. They carry some spray paints including those for plastic, metallic, glow in the dark, glitter fabric spray paint, flourescent and faux finish. If it's top quality fine art supplies that you are looking for then go no further. Blick Art Materials is the right choice. They have a large selection of paints including the Montana Gold Spray Paint. Montana is the leader in artist-grade spray paint and Montana Gold is the top of the line! They also offer a wide variety of stencil making supplies. Joann.com is the right choice. They carry the top brands of good quality spray paints including Simply Spray Soft Fabric Spray Paint. Plus they have all the other stenciling tools you'll need. CreateForLess is a discount art and crafts supplier. Yet you can find the high quality Design Master Colortool Spray Paint specially formulated to provide clean, crisp, consistent color that dries quickly. For use on foam products, delicate fabrics, ribbon, paper mache, pottery, wicker, wood, plastic, glass, metal and many other surfaces. It's great when working with spray paint stencils. Still haven't found out everything you want to know about Spray Paint Stencils? Google has provided a search box below for you to enter the topic of your choice to get further information. Oh wait! Here's that video I promised you about spray paint stencils on a glass vase. Enjoy! Return to Home Page from Spray Paint Stencils. Return to Advanced Tips from Spray Paint Stencils.